A founding member and past President of VAC, Darlene Jackson has taught at Cuyahoga Community College, and Orange Arts Center as well as VAC. She is a member of the Ohio Watercolor Society, and Whiskey Painters of America. Darlene has won awards in many exhibitions, including at the Butler Museum of American Art. Darlene continues her own art education by taking workshops with renowned artists once a year. Emily English has a passion for helping children explore the world of art. She graduated from Hiram College with degrees in both Art and Education. Because of her teaching background, she understands that children need many varied experiences with art in order to foster their creativity. Emily teaches children’s camps, classes and workshops at the VAC. Check out Miss Emily's website, Art with Miss Emily. Brigitte Fiorille has developed a professional career as an Artist, Student, and Instructor. Her personal work is primarily in Ceramics and also explores many other mediums. She enjoys teaching at several Art Centers in Ceramics and Children’s art, onsite classes, and independent events. Working with students of all ages and abilities is a natural fit with the philosophy that ‘everyone finds their way’ and sees her role as a facilitator in mediums, technique, and creative development for each person to accomplish that. She considers art as always having been a true part of her life with early and memorable art experiences beginning at the young age of three. Her first ‘Studio Ceramic’ experience was at Lakeland Community College where she received an Associate of Art (1991). More recently she received her Bachelor of Fine Arts in ceramics at Kent State University (2014) with additional studies in Art Education and Business. A potter by trade, Tracy Ameen has earned international acclaim in the fine arts with her trade mark double-walled pottery (originating in China in the 13th century during the Ming dynasty). Tracy has pieces in the Smithsonian Institute, The White House, and other museums and galleries world-wide. Her studio is Wheel Works Art Studio (est. 1986) in Chagrin Falls. Judy Bennett received a BS in Art Education from Lake Erie College and a MA in painting and drawing as well as a MFA in Sculpture in Kent State. She have shown work extensively statewide and nationally. Judy taught for 35+ years and received the Maria Sharpe Grant for artist as teacher. Says Judy, "I am not sure a person is born with 'talent'. I believe anyone can learn to see and express himself in art if they have the desire and the willingness to work hard and learn new skills of expression. Then with time, the art will pour out of themselves if the person is willing to let go." Robert Crombie resides near Akron. He received his formal art training from Cooper School of Art and Kent State University. Over the past several years he has found great inspiration in the small villages and cities he has visited in the South of France. "St. Remy holds many special memories for me. It’s like home to me. I feel peace there." His appreciation for the architecture and the personality of each small village come through in his work. The quality of Crombie’s work is best summarized in a quote by Sol Ostrow, Dean of Visual Arts and Chair of Painting at the Cleveland Institute of Art. He states “Perhaps what is most effective is his treatment of the paintings surface. His brushwork and drawing bring the paintings into life. His patterns of agitated brush marks are descriptive and in the same instance they give the paintings an abstract quality. He captures, psychologically, his subject, be it nature or the back porch on a building”. Bud Deihl holds graduate degrees in painting and drawing (1963) and sculpture (1965) from Michigan State University. For 14 years he pursued dual careers as a graphic designer and illustrator and as a college art professor. In 1974 he began a university administrative career first as Head of the Fine Arts Department at the University of Cincinnati, then as the Dean of Arts and Humanities at the State University of New York College at Buffalo. He became President of Kendall College of Art and Design in 1989 and concluded his career as President of Columbus College of Art and Design. Since 2004, Mr. Deihl has taught at the Valley Art Center. His courses have included general Drawing, Life Drawing, Master Classes, Oil Painting, and museum seminars at the Cleveland Museum of Art and Design. Mr. Deihl is an award winning painter, including, recently, Best of Show and First Place in Painting at the Gates Mills Annual Exhibition. He has juried many art exhibitions in the great Cleveland area, and offers private instruction in painting and drawing to adults. Tessa Dicker has a B.A. in fine arts from Washington State University. Specializing in photography. Tessa also has a Montessori teaching certification for ages 3-6. She has taught at Gilmour, Ruffing and Horizon. These teaching experiences help her relate well with families and small children. Tessa has a family of her own consisting of a three children, a dog, bunny, goldfish and a very understanding husband with a graphic design background who works with her on sports photography. Tessa founded Fancy Photography four years ago. Fancy photography takes on all aspects of photography from individual portraits, family, wedding, special events, commercial photography, sports photography, homes, pets, senior portraits, and all this can be done in the comfort of your home or on location or at my studio, which is located in the Chagrin Falls area. Tessa enjoys teaching digital photography for Valley Art Center. She receives great pleasure in helping people understand how to use their cameras to their full potential. Becky Frazier studied art education and painting at The Ohio State University and earned a Master’s degree in Early Childhood Education at Kent State University. She has worked in public and private schools as an art teacher, a preschool teacher and as a university instructor. Becky has painted all of her life and loves working alongside children and adults who are inspired by art. She is excited to bring her gifts and talents to Valley Art Center! Terri Hickey has a B.S in Fashion Merchandising and Design from the University of Illinois at Urbana- Champaign and spent a number of years in the fashion world on both the design and manufacturing sides of the business. After many years of being a stay-at-home-Mom, Terri decided to head back to the drawing board and resume classes. She got side tracked along the way by the exciting new world of Precious Metal Clay. Always a lover of jewelry, she immediately recognized how easily her design skills could merge with the properties of metal clay and her jewelry career was off and running. Now a certified metal clay artist, her jewelry has branched out in several directions to include chain maille, dichroic glass and traditional metal work. Susan Jacobs is an artist, art teacher, and entrepreneur. A lifelong resident of the Youngstown-Sharon area, Susan is retired from the public school teaching. She holds a B.S. in art education, elementary certification, and Master Teacher Secondary Art degree, with a concentration in painting from YSU. 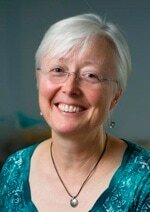 Currently she teaches graduate workshops as an adjunct professor at Ashland University, and instructor for Midwestern Intermediate Unit IV Continuing Professional Education in PA. Susan also teaches painting and drawing classes to local artists, and is sole proprietor of her dog biscuit company Blissful Biscuits, www.blissfulbiscuits.com. Susan's children's book is also available on that site. Her latest accomplishment is founding and directing Community Artworks, www.communityartworks.com. Linda Mayer is an award-winning artist and fine art educator based in Northeast Ohio. Initially trained in acrylic painting, Linda fell in love with the meditative process of creating deeply personal inner landscapes using encaustics and oils. Her work has been juried into numerous regional and national exhibitions. Her work has been published and can be found in private collections across the United States. Linda was featured in the Winter 2015 issue of Encaustic Arts Magazine. Her marsh painting, Simple Pleasure, was chosen Best of Show for the Encaustic Art Institute’s 2015 Juried Exhibition. Linda has been a visual art teacher for 16 years. She graduated with a BA in Art Education from Kent State University and a Master’s Degree in Curriculum and Instruction from Fontbonne University in St. Louis, Missouri. Linda currently teaches visual art for Lorain City Schools. Encaustics (paint consisting of molten beeswax, damar resin and pigment) have a particularly rich translucency and irresistible tactile surface quality. First used by the Ancient Greeks and Egyptians, encaustics have been around for millennia. Encaustic painting fell into obscurity for centuries until artists like Diego Rivera and Jasper Johns began using the medium. The unique beauty of encaustic has led to a dramatic resurgence in recent years with many contemporary artists continually pushing the boundaries of using this expressive and versatile material. Jan Mettee is a watercolor artist who has lived in the Chagrin Falls area for over 20 years. Her paintings most often reflect her love for this area and for the Finger Lakes region of New York, where her family has owned a summer cottage for nearly 60 years. As a painter and teacher, she celebrates close-up images of every day life, and explores the effects of watercolor on a variety of paper surfaces. Educated at Skidmore College and Kean College, she became a student of watercolor years later at the Valley Art Center in Chagrin and eventually one of its instructors. Working primarily in her home studio, she also teaches and conducts workshops throughout northeast Ohio. In the fall, she spends several weeks as an instructor in New York. An award winning artist, Jan’s work has been selected for exhibition in local, state and national shows. Locally, a number of her pieces are included in Cleveland’s Hillcrest Hospital Collection. In 2005, she was commissioned by the city of Rochester, NY to create a painting for their Annual Lilac Festival Poster. She is represented in New York by the Rini Rohrer Gallery. A member of the Ohio Watercolor Society, she received their transparent watercolor society award in 2005. Kim Mettee’s unique eye for design stems from her very early years and no doubt in part due to the strong influence of her mother Jan who’s soulful artistic genius nurtured the creative spirit of her eldest child. In later years Kim received her BFA from the Columbus College of Art and Design. Kim has a history with Valley Art Center as a teacher and a volunteer on the Gallery Committee that spans close to 20 years. Fond memories as a student kept calling her back to the center to share and create new and exciting experiences for the next generation of artists. As a lifetime artist her focus has toggled between various media all of which have a common thread celebrating the beauty of color, shape and rhythm of life. As a teacher, Kim introduces the fundamentals to each student creating a springboard from which to begin their own individual artistic journey. Kim inspires her students by encouraging them to keep an open mind, use their imagination, exercise patience and non-judgement towards themselves and by all means ENJOY the process! As a jewelry designer, Kim’s art is a reflection of her knowledge and experience along with instinctive and emotional creative responses reflecting the beautiful sensibilities of intense observation and interpretation. She uses beads and components ranging from ancient to antique, vintage to contemporary in addition to the use of repurposed materials which reflect a passionate philosophy: Reduce, Reuse, Recycle. Each of Kim’s one of a kind creations stand alone as “Heirloom Adornments of Personal Expression.” She is a featured artist in Valley Art Center’s Gift Shop. *Kim’s photo journal COLOURSTORIES is also featured in Amy Butler’s Blossom Book which is available for purchase through Amazon. *Visit Kim’s Facebook Page, Kim Mettee Designs, to see more photos of her beautiful work. Kate Oulton always knew she wanted to be an artist when she grew up. The joy of making something out of nothing, the freedom to make mistakes and messes, and the beautiful smells of an art studio led her to study art formally- earning her BFA from Kent State University in 2006. After college, she worked in various art and non-art jobs, including managing a gallery, working in children's mental health, and teaching through various arts nonprofits before earning her teaching certificate at Notre Dame College in 2011. Since then, Kate has taught art to to Kindergarten through 12th grade, most recently at Chagrin Falls Intermediate School, where she gets her kicks mentoring 460-ish young artists in 4th-6th grade as they travel on their artistic journeys. 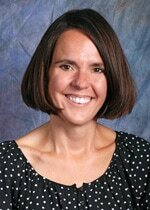 Previously Kate also worked in Solon City schools, and with BAYArts, before becoming an Eastsider again this winter. Kate's own personal artwork travels the line between sculpture and drawing, exploring concepts of memory, existence, and time. Originally from Bainbridge, and a Kenston graduate, Kate has taken classes at the Valley Art Center since she was knee-high to a potter's wheel, and is absolutely thrilled to rejoin this wonderful organization! Catherine Davies Paetz loves to create wearable art that brings people joy. Her original jewelry designs, made from silver metal clay and/or silver wire, explore playful line work or surface texture and may be accented with gold, enamel, beads, or pearls. Catherine has been creating jewelry for more than 35 years and has a BFA in Metals. As a Certified PMC Artisan, she regularly teaches classes and workshops in jewelry making. She has presented seminars at International PMC Guild Conferences, written several magazine articles, an instructional book, and her jewelry has been included in numerous books and other publications. In 1983 with two small children to support I worked part time at Delphi Stained Glass. I started with flat glass windows, quickly moving into sandblasting. In a short time I tried fusing (melting glass in a kiln). I was hooked! Mostly self taught, I have never graduated from the School of Hard Knocks, my favorite class being Trial and Error. Along with the failures have come many breakthroughs that guide my design. I continued to learn new techniques, lamp working, off hand glass blowing and sand casting are a few. My new work combines design elements of several techniques. 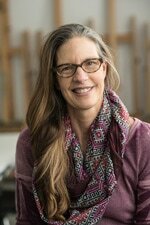 Deborah Pinter received her BFA in Photography from the Cleveland Institute of Art and earned her MA from New York University/International Center of Photography joint graduate program. Creating her imagery primarily with photograph processes, in 2013 she was invited to participate in the Monothon Event at Zygote Press, This experience reigniting her love of printmaking and the monotype process, which is her current method of working today. Deborah’s work is included in numerous private and public collections including, The Laura Ruth and Fred Bidwell Collection, The Cleveland Museum of Art, The Cleveland State University Art Collection, and Progressive Art Collection. Exhibition venues include The Cleveland Botanical Gardens, The Cleveland Museum of Art, The Cleveland Print Room, Maria Neil Gallery, and Zygote Press. Sandy Richert has been on the faculty of Valley Art Center since 1978 as the enameling instructor. She teaches the classical techniques of this ancient craft focusing on the why as well as the how, encouraging students to find and follow their strengths. Her work has been widely exhibited including in The Cleveland Museum of Art May Show and the Smithsonian’s National Air and SpaceMuseum. She received first place in the 1993 VAC Juried Show and a purchase award in its 1982 anniversary exhibition. She coordinated the Celebration of Enamel in 2004 obtaining for VAC one of the first grants offered by the international Enamelist Society for promoting the art of enameling. She has written articles on the medium for Glass on Metal magazine and produced a slide presentation and video on enameling for Ohio Designer Craftsmen. She has also served on The Kent State University Foundation Enameling Outreach Program Advisory Board. Joan Cooper Rusek has a dual career in fine art and freelance writing. She is an award-winning sculptor and potter and has taught fine art classes and workshops at the Valley Art Center for about 20 years. Her spirited work has been selected in the region’s most prestigious juried shows including Gates Mils Art Show, Fairmount Fine Arts Center and the Valley Art Center. She won the pottery award at the Youngstown Women’s show, a purchase award for Art on The Square, Best 3-Dimensional Art from the Valley Art Center’s juried show, and honorable mention from Fairmount Fine Art Center. She has a Bachelor of Arts degree from Edinboro University in Pennsylvania. She resides in semi-rural Chesterland, Ohio. As a writer, and creative force, she has also been involved in numerous award-winning advertising and public relations campaigns. Individually, she won a gold award for creating and writing a regional multimedia public awareness campaign and two silver awards for a print advertising campaign. She has also won several national awards for news and feature writing in her work with Sun News. Joan produces art that is functional and decorative. Influenced by the natural world, she incorporates plants, animals and sometimes insects she sees in her backyard into her work. She also sees beauty and whimsy in faces, facial features, hands and feet, which can provide either the form or the decoration in her artwork. She works in clay, mortar, concrete, wire, glass shards, crystal, glass beads and polymer clay. She said in her next life she is going to work in lighter-weight materials, but for now she is grounded in working with materials from the earth. 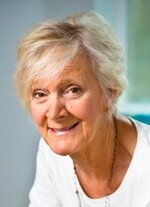 Joan is also a Reiki Master and is both a student of and a teacher of using energy for healing and self-discovery. She has taught workshops incorporating energy, creativity and art in Florida, New York and Ohio. Contact her at jcooperrusek@yahoo.com or (440) 729-4290. You can also friend her on Facebook, but be patient – sometimes she likes to unplug to allow space for creativity. Valley Art Center's Drawing Instructor Gary Schmidt earned his B.F.A. in Studio Art from Kent State University in Kent, Ohio, and has taken numerous workshops and post-graduate courses. He worked as an art teacher for grades K-12 for 35 years and has taught adult courses in Black and White Photography, Figure Drawing, Beginning Drawing, and Ceramics. Gary enjoys working in drawing, painting (oil, acrylics, & watercolor), photography (wedding and commercial), airbrush, medical illustration, furniture and house design, and carpentry, and Sculptural Ceramics Vessel. About his creative process, Gary says, "I have painted, photographed, drawn and constructed art and aesthetic objects. Clay has allowed me to use all of my previous experience in design, problem solving and building. My goal in my clay work is to create unique sculptural forms in a relationship with the line, shape, and color of the designs that interact with them. Underlying all of my endeavors is an ability to draw. I feel I have an understanding of how to teach drawing especially to the non gifted student. I think that anyone can develop the skill of drawing and that it can be of benefit in many areas and a joy in itself." Michael Steinberg's photographic experience spans over three decades in the Cleveland area where he has been a wedding photographer and commercial photographer. His photography has been featured in The Knot wedding magazine and his contemporary, photojournalistic style of photography has appeared in publications such as Time, Business Week and Forbes. One of Cleveland Ohio's best wedding photographers, Michael has worked in all parts of northeast Ohio including Akron, Youngstown, Canton, Lorain, and as far away as Sandusky and West Virginia. What is it that sets Michael apart from other photographers? Maybe it's his keen eye for beautiful compositions or his friendly, easy-going personality or possibly his extraordinarily honest shooting philosophy. His high-end, digital images have set a new standard in digital wedding photography. He is also experienced with a wide variety of wedding photography services including Protestant, Orthodox Jewish and Catholic weddings. Michael is also an award winning member of WPJA and a member of Digital Wedding Forum. Judy Takács began her art career in 1986 with a Bachelor of Fine Arts in Illustration and Portrait Painting from the Cleveland Institute of Art. On her eighth Best in Show award over the past few years (two of them from Valley Art Center Juried exhibitions), she has curated, juried and exhibited in solo, group and juried shows at the Butler Institute of American Art, Zanesville Museum of Art, Evansville Museum, Salmagundi and National Arts Clubs, and at art centers, colleges and galleries throughout Ohio and the nation. Her paintings are in the permanent collections of Susquehanna University, Artists Archives of the Western Reserve and the ArtNEO Museum. ​Her paintings have won awards nationally and she has received recognition from the Portrait Society of America, Allied Artists and the Art Renewal Center. A Signature Status painter with the Akron Society of Artists, Judy is also is archived with legendary Cleveland artists at the Artist Archives of the Western Reserve. She is past chair and now serves on the New Media Relations Committee of the Cecilia Beaux Forum of the Portrait Society of America and has participated in the Women Painting Women exhibitions. 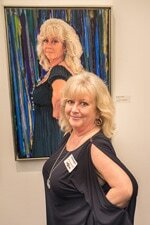 In 2013, Judy the Ohio Arts Council granted her the Award for Individual Artistic Excellence for her ongoing traveling painting project, Chicks with Balls: Judy Takács paints unsung female heroes…now 40 portriats strong and growing. Her paintings, projects and contributions to the figurative art world are noted on Wikipedia. As a life-long painter of people, Judy has found that fascinating individuals find their way into her paintings. Her goal is to depict a living, breathing soul whose presence invites viewers to linger, connect and think. Mary Urbas has been the Gallery Coordinator/Exhibition Curator/Installation Designer at The Gallery in Lakeland Community College in Kirtland since 2005. She initiated a highly successful “May Show at Lakeland Juried Art Exhibition”, which features local and regional artists, and curates “The Skull and Skeleton in Art: Folk Art to Pop Culture” bi-annualy. Prior to this, she was the Assistant Director/Gallery Curator at the Valley Art Center for 4 years after closing her gallery, called “The Gallery”, which featured national, regional and local artists, creating Fine Art and Contemporary Crafts; both located in Chagrin Falls. Mary received her B.F.A. in Textile Design, Silk Screen Printing, Weaving and Printmaking, from the Cleveland Institute of Art. She was the Gallery Manager and Shipping/Receiving Manager at Sylvia Ullman's American Crafts Gallery in Cleveland, for over 17 years. During this time Mary showed her silkscreened wearables, wall hangings and fabrics in Juried Exhibitions and Art Fairs throughout Ohio, Michigan and Pennsylvania; receiving many honors, including several Best in Crafts awards. Mary is Part-time Faculty at Lakeland Community College; she teaches Art Fundamentals to students in the Early Childhood Education Program. She also teaches Textile Design, and Professional Practices for Artists/ The Business of Art for Artists: Presenting and Promoting Your Art, as well as summer Art Camp for grade school children through Lakeland’s Continuing Education Division. She is also part time faculty at Willoughby Fine Arts and Valley Art Center. Mary Urbas has over 35 years of experience in the professional art world as a gallery owner, curator, juror, teacher, consultant, and exhibiting Fiber and Clay Artist. During the summer months when Mary isn't knee deep in her garden or rose beds you'll find her scoping out the local and regional art fairs and gallery exhibitions… looking for artists for future exhibitions. Kathy Vencl has been an artist her entire life and has extensive experience in an educational setting. She has taught at the VAC since 1995, has led elementary art enrichment programs at Hawken, Gurney and Sands and has continued her education with professional artists all over the region. Kathy has been teaching art to future governesses and nannies at the English Nanny and Governess School since 1998, emphasizing the importance of the arts beginning at birth. She believes that art contributes significant value to the lives of all children and this philosophy is evident in her classes. You will often peek into her classroom and find kids assembling huge paper maché 3D characters and animals, creating masterpiece paintings from many resources, or building elaborate birds and nests out of clay. Kathy particularly enjoys working with students as art provides opportunity for exploring, experimenting, and problem-solving. Kathy’s passion is the pure joy that art can bring to anyone. Graduate - Cooper School of Art, Cleveland, Ohio 4th year- Cleveland Institute of Art, Cleveland Ohio. Owner and Resident Artist- Serenity Studio, Aurora, Ohio. I create Portraits and original paintings in oil, watercolor and pastels. I also sell Liturgical Prints that raise money for many charities and churches. 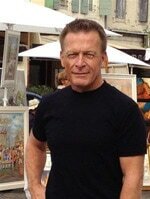 For over 40 years, I have competed and won prizes in National, Regional, and local art exhibitions. I have a fondness of rural America and it's people because I grew up on a 600 acre farm in Ohio. My earliest memory as a child was drawing faces, human or animal, which led to landscapes and still-lives. I love sharing this enthusiasm for Nature with students in my classes; to inspire each person to express in their own way their view of the world around them. It is my privilege to teach at the Valley Art Center of Chagrin Falls.